From London's glittering West End to Broadway's bright lights, from her Academy Award-winning role as Elizabeth I in Shakespeare in Love to 'M' in the James Bond films, Judi Dench has treated audiences to some of the greatest performances of our time. She made her professional acting debut in 1957 with England's Old Vic theatre company playing Ophelia in Hamlet , Katherine in Henry V (her New York debut), and then, Juliet. In 1961, she joined the Royal Shakespeare Company playing Anya in The Cherry Orchard with John Gielgud and Peggy Ashcroft. In 1968, she went beyond the classical stage to become a sensation as Sally Bowles in Cabaret, adding musical comedy to her repertoire. Over the years, Dench has given indelible performances in the classics as well as some of the greatest plays and musicals of the twentieth century including Noël Coward's Hay Fever, Stephen Sondheim's A Little Night Music, Kaufman and Hart's The Royal Family and David Hare's Amy's View (for which she won the Tony Award). Recently, she made a triumphant return to A Midsummer Night's Dream as Titania, a role she first played in 1962, now played as a theatre-besotted Queen Elizabeth I. Her film career has been filled with unforgettable performances of some unforgettable women: Queen Victoria in Mrs. Brown, the terrifying schoolteacher Barbara Covett in Notes on a Scandal and the writer Iris Murdoch in Iris. And, for the BBC, Dench created another unforgettable woman when she brought her great comic timing and deeply felt emotions to the role of Jean Pargetter in the long-running BBC series As Time Goes By. And Furthermore is, however, more than the story of a great actress's career. It is also the story of Judi Dench's life: her early days as a child in a family that was in love with the theatre; her marriage to actor Michael Williams; the joy she takes in her daughter, the actress Finty Williams, and her grandson, Sammy. 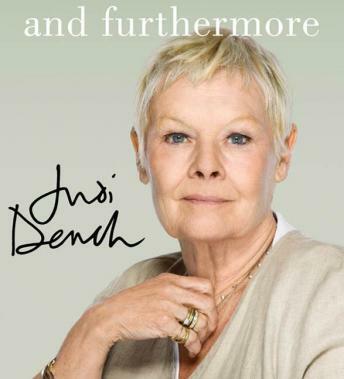 Filled with Dench's impish sense of humor and diamond-sharp intelligence, And Furthermore is the audiobook every fan of the great Judi Dench will cherish. Judi Dench is a wonderful, thoughtful extraordinary woman. Such enjoyable remembrances of a lovely friend well lived. Very entertaining! I enjoyed this book. I had no idea what she's been through. Interesting view on the arts between UK and USA. I like her in the things I've seen her in, and am tickled that there was so much more to her performance. Who knew all the trials and tribulations she's endured, the book describes without complaining, but more like "pick yourself up" and "life goes on" in perfect Dame professionalism. I love that there is more to the actress than what we commonly know, and not splattered on pop-media.